that the browser will automatically submit the controls’ values to the server. All you have to do is specify the URL of the program to intercept them on the server. The URL used In this example contains the path to ASPages folder (under the Web’s root folder). 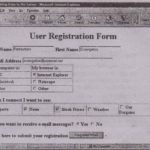 The first part of the URL is known to the browser from the address of the current document. The data will be transmitted to the server when the Submit button (Register Now) at the bottom of the Form is clicked. <INPUT TYPE-Checkbox NAME=” News , VALUE-‘ON”> News. 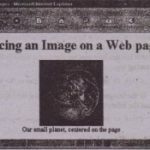 Do you want to receive e-mail messages? All intrinsic controls with the exception bf the Select control have a VALUE attribute too. A button’s value is its caption and a Text control’s value is the text displayed on the control. The equivalent property of the Select control is the Selected Index property which is the index of the item currently selected You can manipulate the Value and Selected Index properties of the various controls from within your script. Finally, the most common event in scripting Web pages is the on Click event which is generated when the user clicks a control. The Text TextArea and Select controls don’t recognize this event. 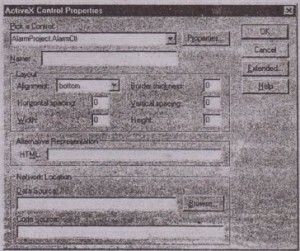 The most common event for these controls is the on Change event which takes place when the text in a Text or TextArea control is changed or when the user makes a new selection in the Select control. This is all the information you need to start scripting your Web pages. 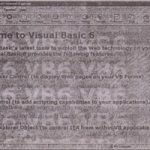 VBScript is similar to Visual Basic and we can look at an example right away. (discussed in Chapter 2) or enclose the arguments in parentheses to let VB Script and Visual Basic handle the conversion for you. A scripting language such as VBScript made it possible for Web authors to develop dynamic content for their Web pages. But that isn’t all In less than a year after the introduction of VB Script Microsoft decided to “activate” Web pages hence the term Activt!X. Since you have the means to program a Web page why not add programmable objects to it at will? The programmable objects are nothing ActiveX controls. 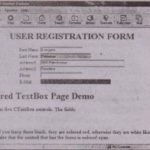 If there was a way to place ActiveX controls on a page you could access their methods and properties from within VBScript and thereby create an active page. 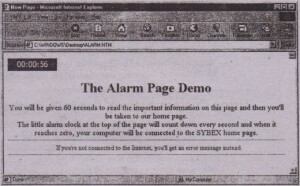 An active page is similar to a small application that runs within Internet Explorer. . The next step was to develop ActiveX controls that could be used on Web pages. And Microsoft released a number of those. Now with Visual Basic 6 you can create your own ActiveX controls for use on Web pages. In the next section we’ll test the controls we developed in Chapter 16. In the last section of this chapter we’ll look at DHTML which is nothing more than HTML enhanced with VBScript code segments. Microsoft has released a number of ActiveX controls for use on Web pages. Some of these controls come with Internet Explorer induding the Structured Graphics control, the Filter control, and the Sequencer control. You can find information on these controls and . Practically every ActiveX control “y’ .u can place on a Visual Basic Form can also be used on a Web page (of course, it must first be downloaded and installed on the client computer).In the next few sections, we are going to see how the custom ActiveX controIs we built in the previous chapters can be used on Web pages. you must provide visual feedback from within your script. 3. Set the contrel’s name to AlarmCtl. 4. Click the Properties button to set additional properties for the custom control. For the Alarm control set its CountDown property to True. 6. Choose View >HTML to open a text editor displaying the page’s source code. Select the definition of the <OBJECT> tag and copy it to the Clipboard. Inserting the <OBJECT> tag for a custom control on a Web’page isn’t complicated after all. This definition doesn’t change even when it’s installed on another computer so you can copy the same definition from any Web page that contains it.